For vegetarians, going to Chinese restaurants is often a dicey endeavor. In China, if you ask for meatless dishes at a restaurant, you'll often hear something along the lines of, "Hmm. Well, we have plenty of chicken dishes. Or beef. Or fish." (In Chinese, the word for "meat" is the same as the word for "pork".) Even here in the US, often "vegetarian" dishes in Chinese restaurants would contain pork or chicken stock or fish sauce. A while back, I started teaching Chinese vegetarian cooking classes at ICE and the Brooklyn Brainery to help vegetarians navigate the tricky landscape of Chinese cuisine. One of the dishes we've done in class is vegetarian mapo tofu, and over the years I've refined it to make it even better. Now, traditionally, Sichuan mapo tofu contains plenty of ground pork for flavoring, but there is a lesser-known vegetarian version called mala tofu. (Mala refers to the numbing spiciness that comes from Sichuan pepper...numbing in a very good, highly addictive way.) It's often made by just leaving out the pork, which makes the flavor rather flat, in my opinion. What you need to do is to get creative with shiitake mushrooms. 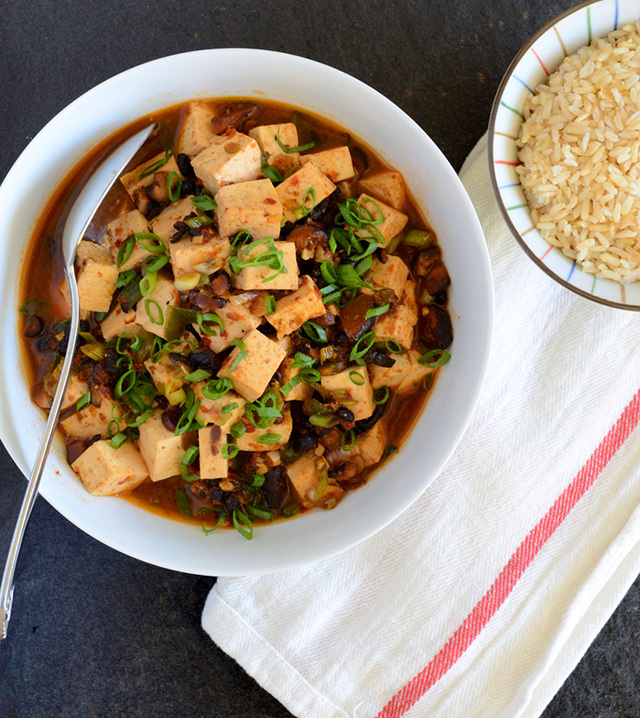 For the best vegetarian mapo tofu, I soak shiitake mushrooms in room temperature or warm water, then mince the caps. Then I stir-fry the minced mushrooms with a slightly larger dose of fermented black beans until both are crispy and fragrant. And the water that the mushrooms were soaked in, so full of umami goodness? It gets mixed into the sauce to add some oomph. Look how nice and juicy the mushrooms and black beans are. They add a lot of earthy flavor back into the dish. If you're looking for more ideas for vegetarian dishes, take a peak at the Vegetarian recipes in the archive or, if you're in New York, check out an upcoming class! 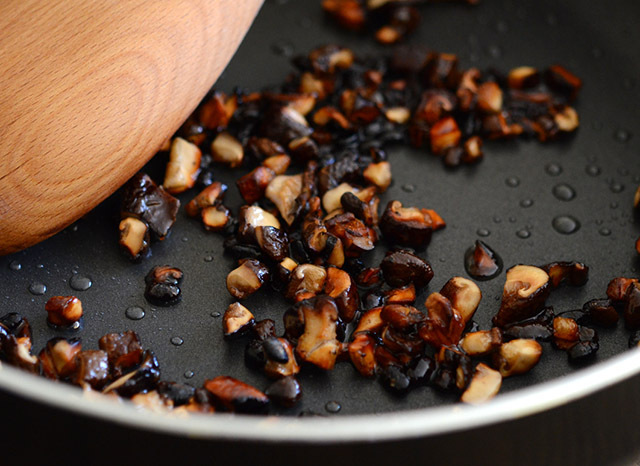 Soak the shiitake mushrooms in the 1 cup of warm water for 15 to 20 minutes, until softened. Drain the shiitakes and squeeze out the excess water into the bowl. Keep the mushroom-flavored water, as you will need it for the sauce in the next step. Discard the stems of the mushrooms and finely chop the caps. Prepare the sauce: In a small bowl, stir together the mushroom-flavored water, chili bean paste, rice wine, soy sauce, sesame oil, sugar, and Sichuan pepper. Set aside. Rinse the black beans to remove any grit and mash them with the back of a spoon. Heat a wok or large skillet over medium-high heat until a bead of water sizzles and evaporates on contact. Add the peanut oil and swirl to coat the base. Add the minced mushrooms and mashed black beans and stir-fry for 2 minutes, until the mushrooms are crispy and the black beans are aromatic and a bit crispy as well. Reduce the heat to medium, then add the scallion whites, garlic, and ginger and stir-fry until fragrant, about 1 minute. Pour in the sauce and bring the liquid to a boil, the reduce to a simmer. The liquid should now have a nice red color. Gently add the tofu cubes, being careful to not move them around too much or else they will break up. Allow the sauce to simmer for about 2 to 3 minutes so the tofu can cook and absorb the the sauce. Carefully push the tofu to the sides and create a small well in the middle. Stir in the cornstarch mixture in the center. Allow the liquid to simmer for another minute, until the sauce has thickened enough to coat the back of a spoon. Transfer to a deep plate or wide bowl, sprinkle the scallion greens on top, and serve hot.